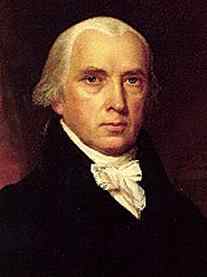 James Madison was born on March 16th, 1751 in Port Conway, Virginia. The eldest son of a wealthy landholder, Madison lived a life of privilege. In 1769, after being educated at home by private tutors, Madison began the College of New Jersey (now Princeton), studying history and government and forming a political club called the American Whig Society. He graduated after only two years and returned home. "What is government itself, but the greatest of all reflections on human nature? If men were angels, no government would be necessary. If angels were to govern men, neither external nor internal controls on government would be necessary." (from Federalist No. 51). In 1776, Madison helped write the Virginia Constitution and was elected to both the Virginia legislature and the Continental Congress. His notes on the Constitutional Convention have been used to piece together the series of events that led to the signing of the United States Constitution. During 1788, Madison, along with Alexander Hamilton and John Jay, wrote The Federalist Papers, a series of eighty-five political essays which illustrated the problems of the Republican government, asserting that federalism would preserve the individual's freedom. Madison served in the Virginia House of Representatives from 1789 until 1797. Madison married Dorothea (Dolley) Payne Todd on September 15th, 1794. He was appointed Secretary of State by President Thomas Jefferson in 1801. The fourth President of the United States, Madison served through the War of 1812 until 1817. Upon leaving office, he and Dolley moved to Montpelier, but Madison still found the time to help Thomas Jefferson found the University of Virginia and to take part in the Virginia Constitutional Convention in 1829. He died on June 28th, 1836. A series of articles written to gain support for the Constitution. Contributed to by Hamilton, Jay, and Madison.